Will stocks and currencies drag gold lower? 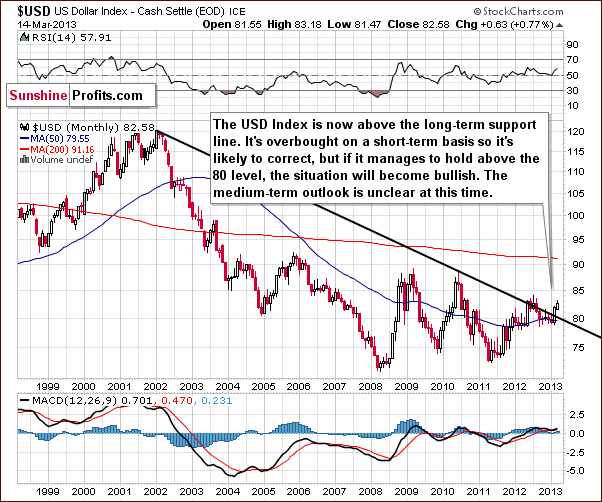 In the very long-term USD Index chart, we have seen the situation change somewhat this week. The breakout here is now quite significant, and we must consider the possibility that the USD Index might move higher in the medium-term. The situation in the short-term, however, is overbought, so it is likely that we will see the index decline soon and then we’ll see what happens next. If the correction stops at the declining support line, around the 80 level, then the breakout will be confirmed, and a rally will likely follow. If however, the correction takes the index below the 80 level, the whole breakout will be invalidated, and lower values would probably follow. At this time, the medium-term and long-term outlooks are somewhat unclear based on this chart alone.